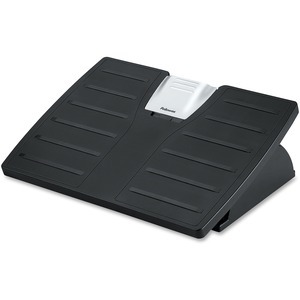 Adjustable footrest is easy to adjust with foot pressure. No bending or stooping required. Simply apply foot pressure to adjust tilt angle 30 degrees forward or back. Locking mechanism holds footrest in preferred positions or allows for "free-floating" tilt action to increase blood flow and circulation in lower legs. Simple mechanism provides three different height settings for your personal comfort: 4-1/8" (low setting), 4-7/8" (middle setting), and 5-5/8" (high setting).